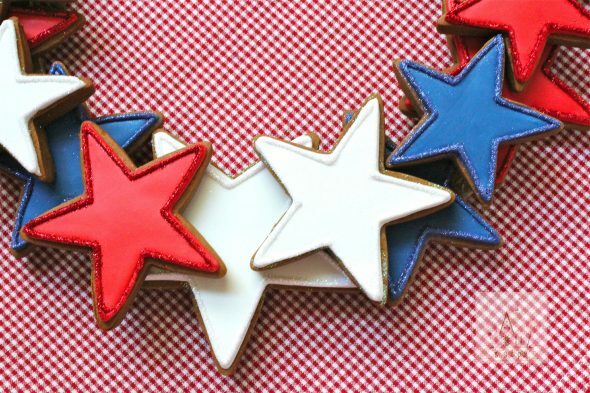 Looking for a fun way of dressing up your table for the 4th of July? 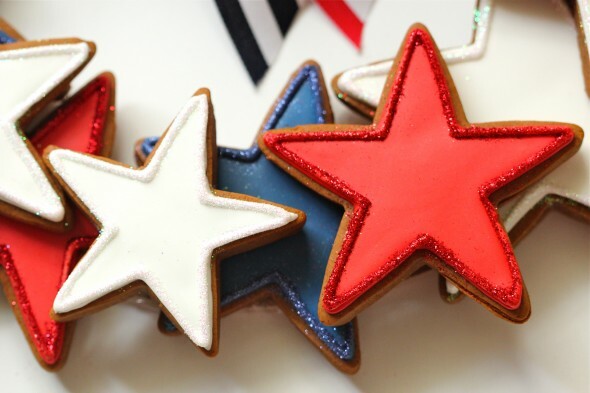 This star cookie wreath is easy to make, and doubles as edible party favors too! Once your celebrations are over (or while they’re happening! 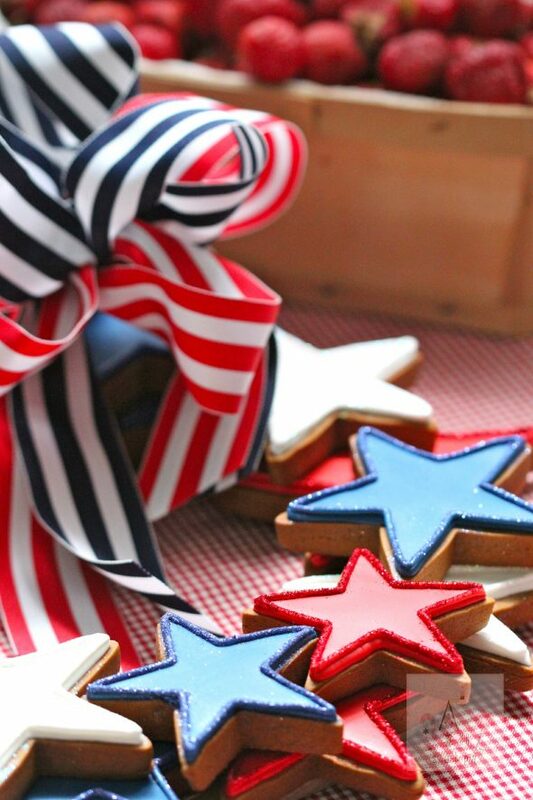 ), guests can grab a cookie as a sweet treat! 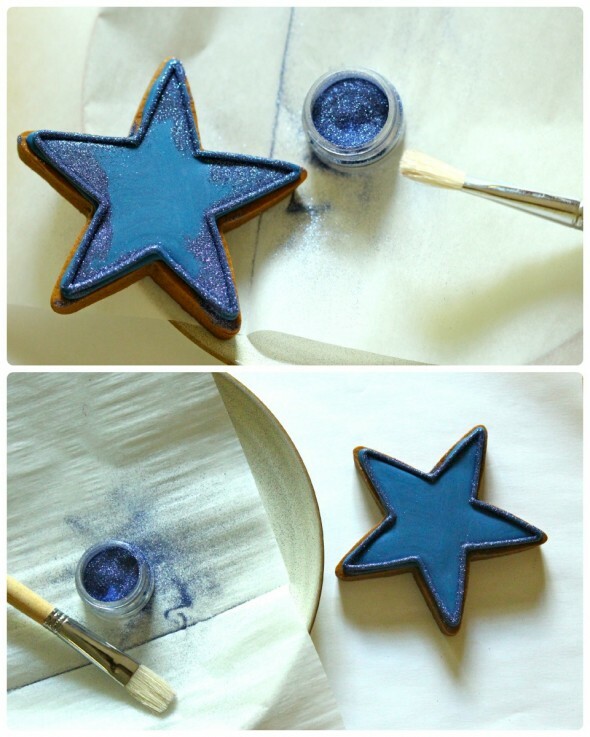 I just stacked my star cookies, and didn’t adhere them to each other with royal icing; that way they’d be easy to take off. You could put them together with royal icing, and hang the wreath if you like. Might be a little delicate though! 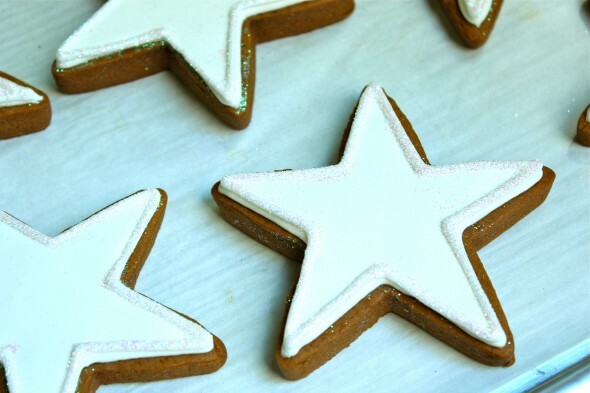 When decorating cookies, icing consistency is key. For a video on how I find the right consistency, click here. 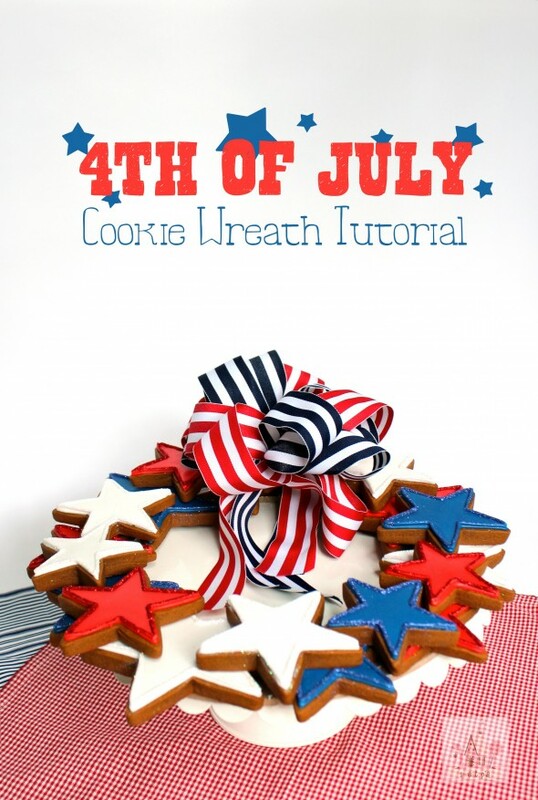 For a more detailed tutorial on how to decorate cookies, click here. Step 1. 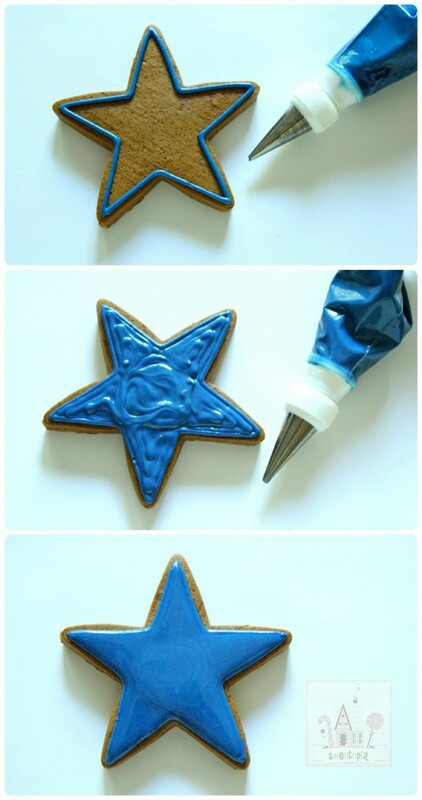 Outline your cookie with royal icing. Step 2. Fill in the center of your cookie with the same piping bag and icing, right away. Step 3. Shake gently to help smooth icing over. Step 4. 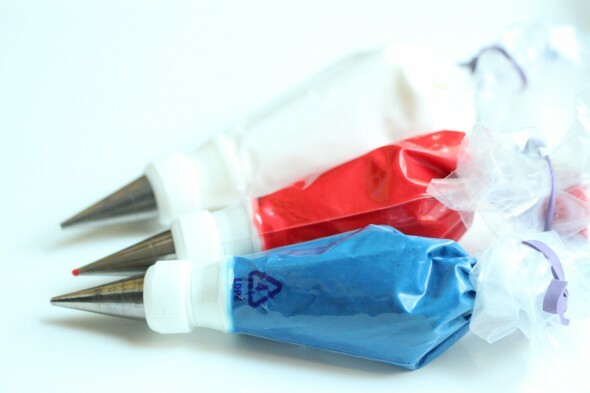 Let your icing dry for 12-24 hours. 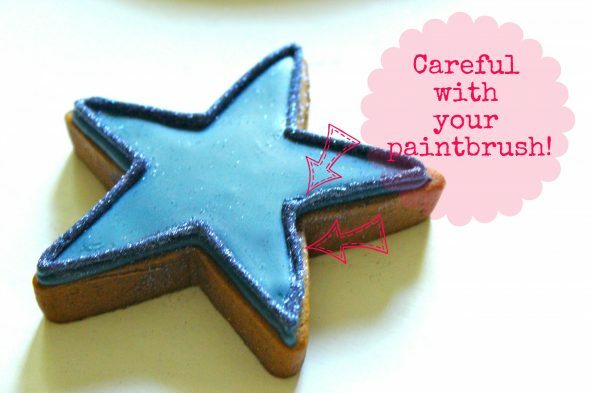 See here for a video on drying decorated cookies. 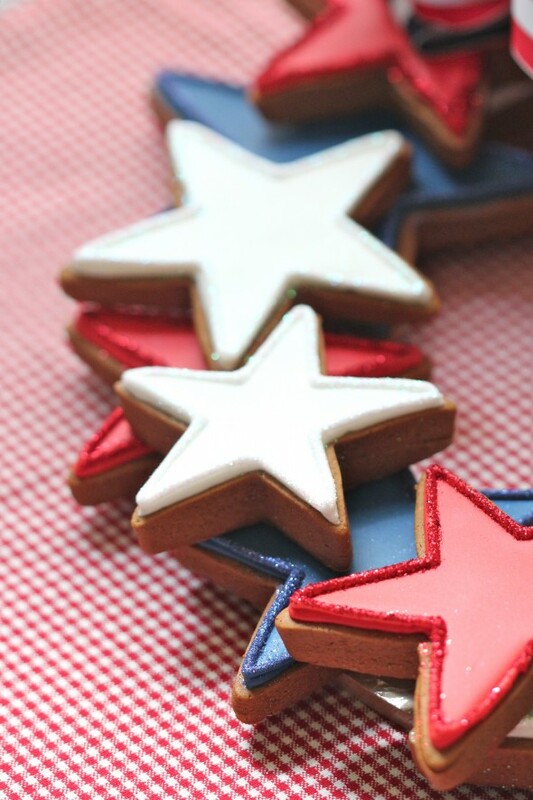 If you’d like to see a video on decorating cookies, click here. Thanks to those who helped me chose on Instagram and twitter. 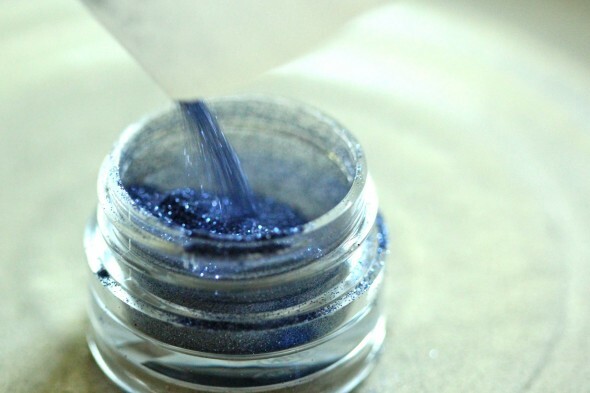 Before you get started, you’ll need to have your disco dust ready. I fold a small sheet of parchment and place it on a plate, ready to catch falling disco dust. 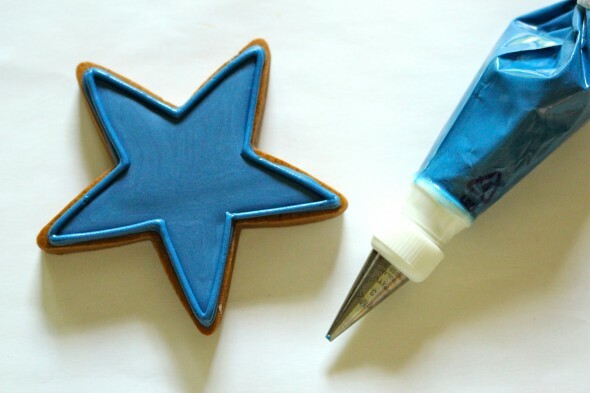 Step 5: Outline your star with a #3 star tip, using the same royal icing you used to flood the cookie. 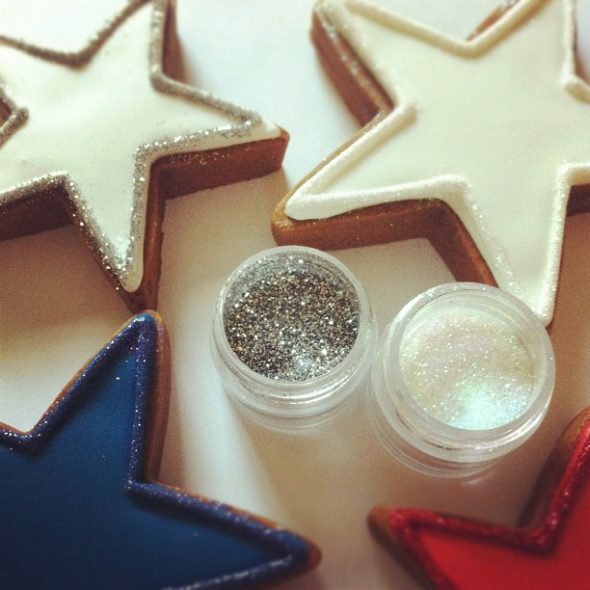 Step 6: Holding the cookie over the parchment, gently sprinkle disco dust onto the wet icing. (You’ll have to excuse the bad photo; it’s hard to photograph at the same time!). 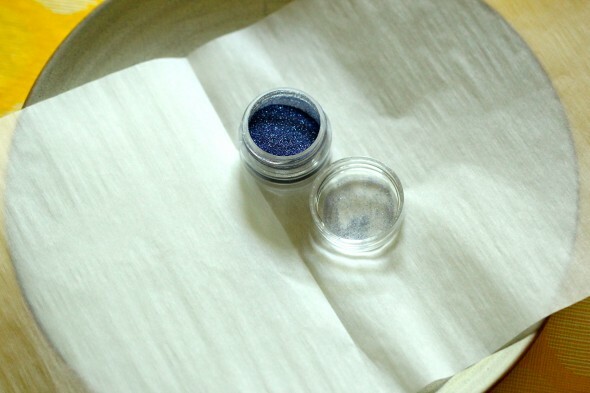 Pick up parchment paper and pour excess disco dust back into the container. Except for the messed up icing lines! (Oops!). Careful around the wet border when you’re brushing the extra disco dust off. 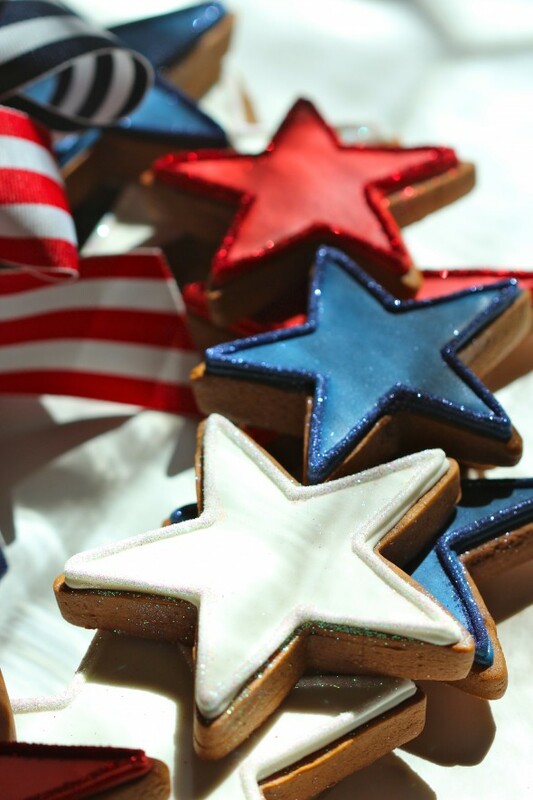 You could wait until that icing dries to brush the extra disco dust off, however, in the humidity we’re experiencing here right now, I find the little disco particles stick more to the surface of the cookie over time, making it harder to remove later. Once all stars are outlined, let them dry for about 2-6 hours before you stack them. Instead of making the ring base out of cookie dough. I went with a craft ring and chose a gingerbread dough to match and help the base blend in with the cookies. 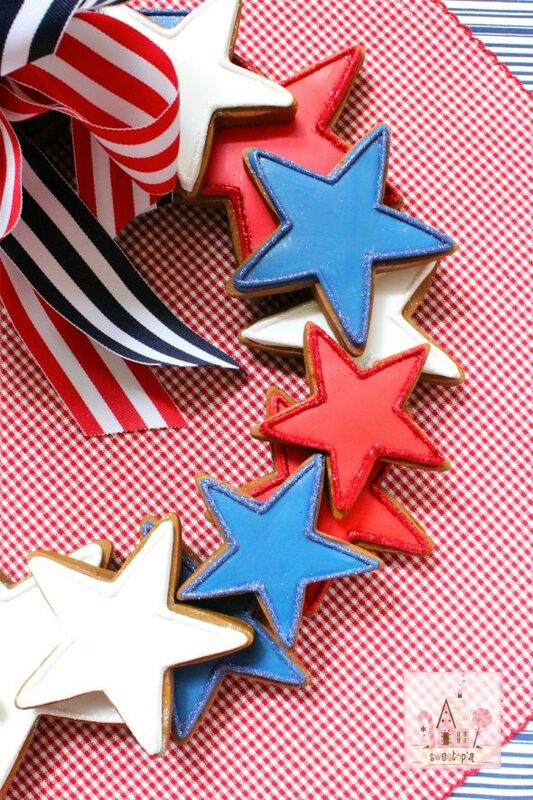 (In case you could see the ring through the cookies). 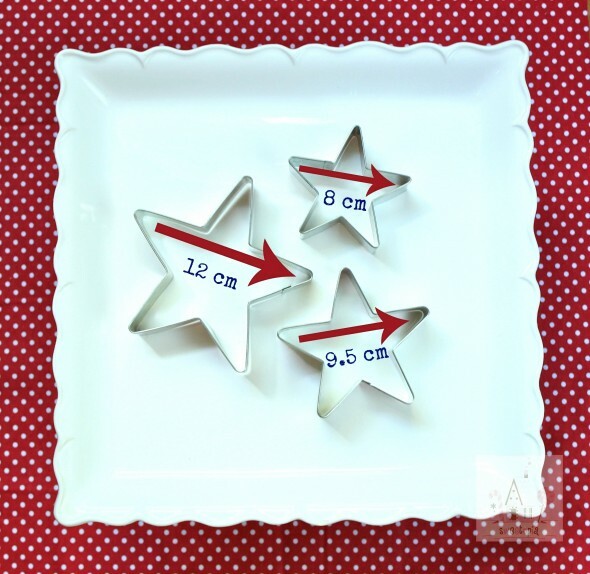 If you’d like to make your ring with cookie dough, use the edges of a 12″ and 10″ bowl to make the template. To make the ring food safe, I wrapped it in saran wrap., a.k.a. cling wrap. 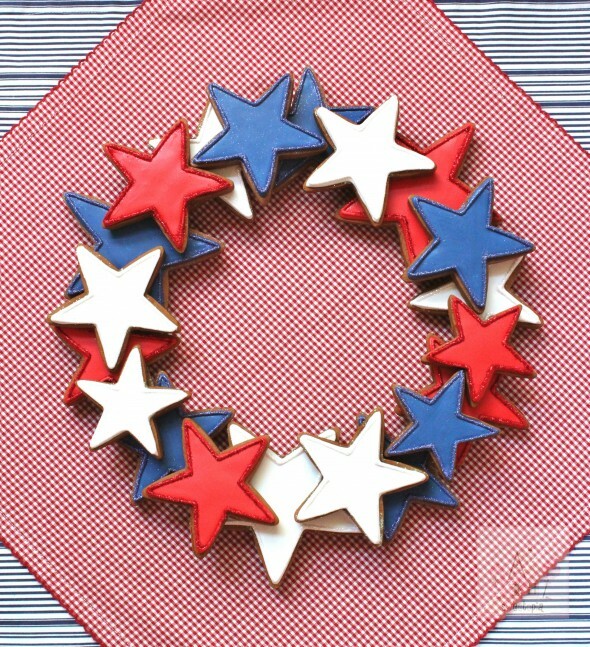 You could cover the craft ring with red, blue or white material first, if you like. Stack the cookies, either just letting them sit on top of each other or adhering them with royal icing. 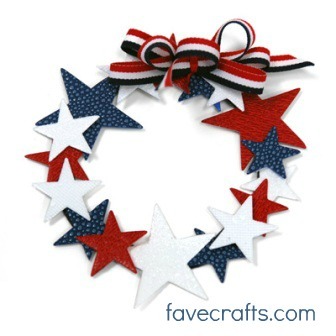 Thank you to favecrafts for allowing me to use their wreath to model after! 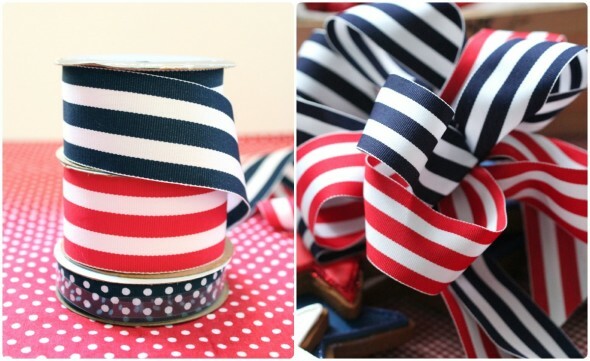 I couldn’t find quite the same ribbon as on favecrafts.com, but ended up using two red & navy striped ribbons instead. 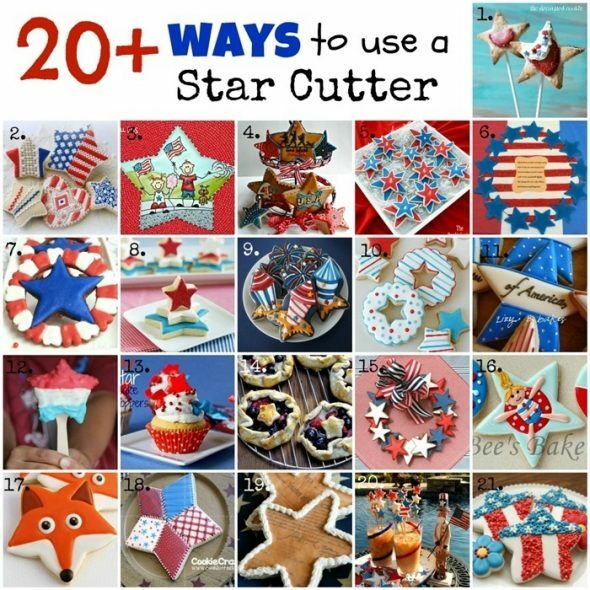 (And didn’t end up using navy polka dot ribbon). Sitting on some colored material (Pier One napkins b.t.w. ), the wreath already looks more festive. A hurricane lamp with a white candle might look nice too, I think! 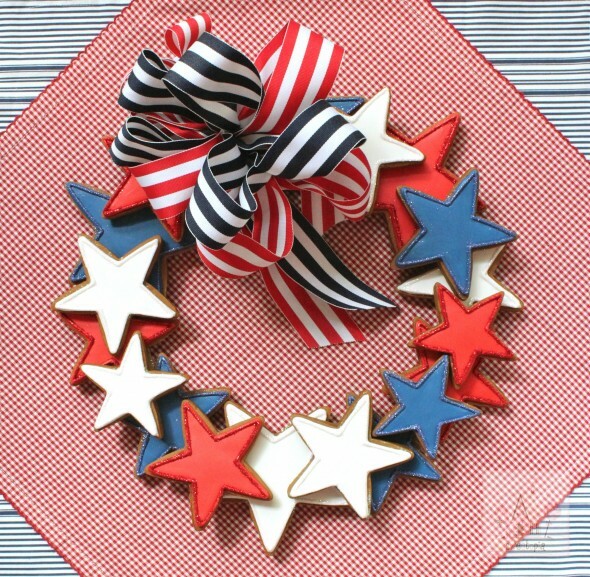 And if you’d like to add some snacks or other items to the middle of the wreath, without the ribbon is the way to go. 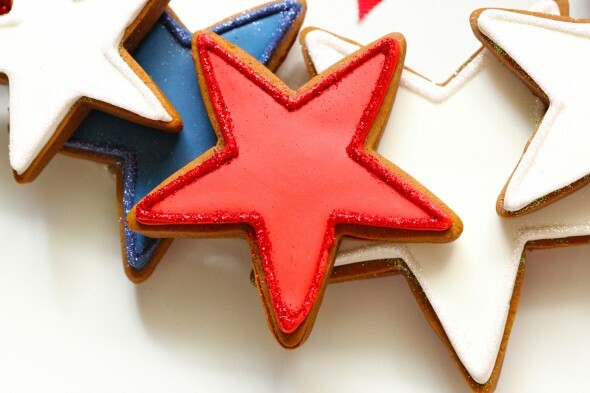 You can stack them any which way you like, but an fyi for you; I ended up using 3 small star cookies (would have like a few more of those), 14 medium cookies and 3 large ones. 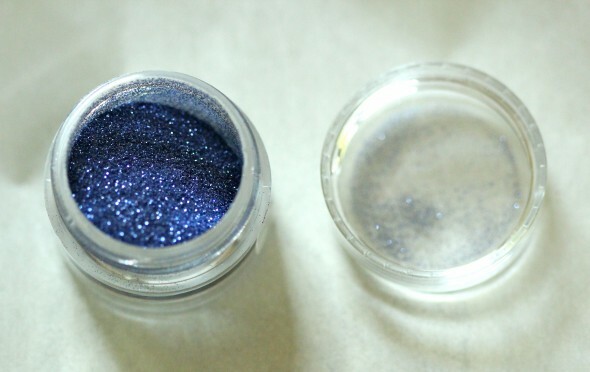 You should know that the quest for finding out if disco dust will be FDA approved is on-going. Apparently, it’s being researched, and for now is considered non-toxic. What does that mean? Not harmful if ingested, but in my humble opinion, a good rule of thumb – everything in moderation. 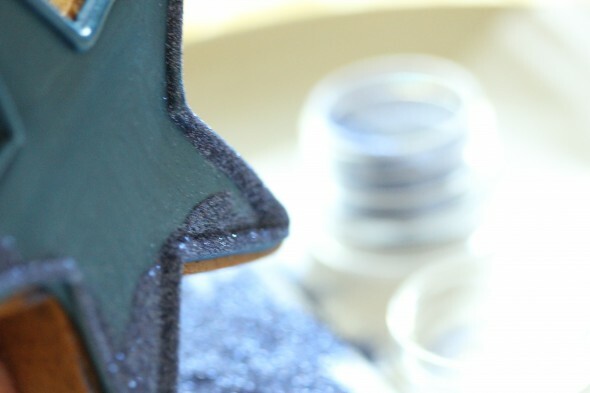 An alternative to using disco dust for this project is sanding sugar. 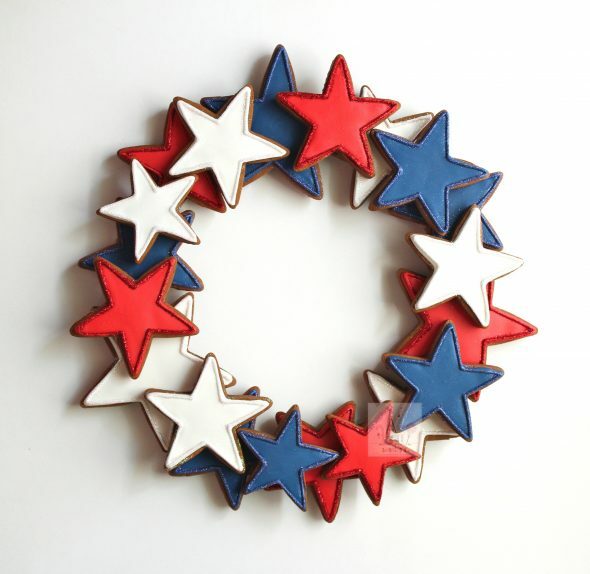 A few other adorable cookie wreaths for you; this gingerbread man wreath from Martha Stewart (I made this one before I started blogging, and it was truly adorable!) & this beautiful Christmas holly wreath by Julia Usher. Fancy Flours even has a kit to make her wreath! 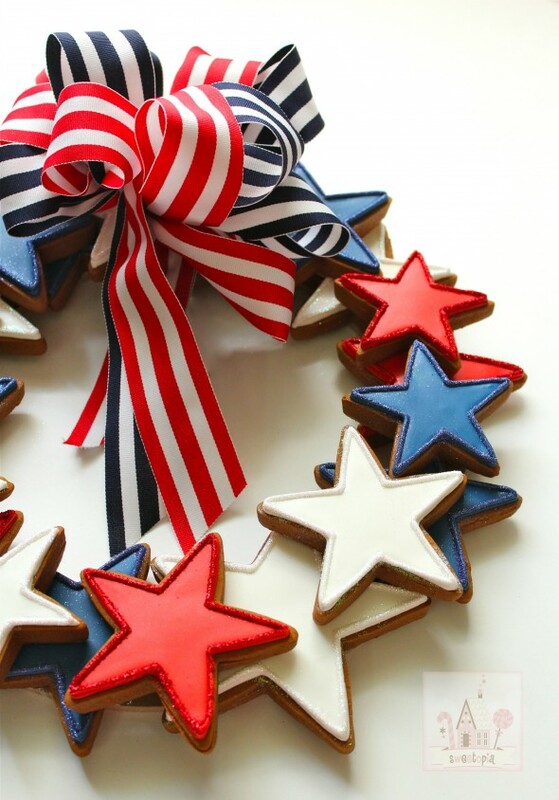 Do you have any cookie wreaths you’ve made or seen, which you’d like to share in the comment section or on facebook? 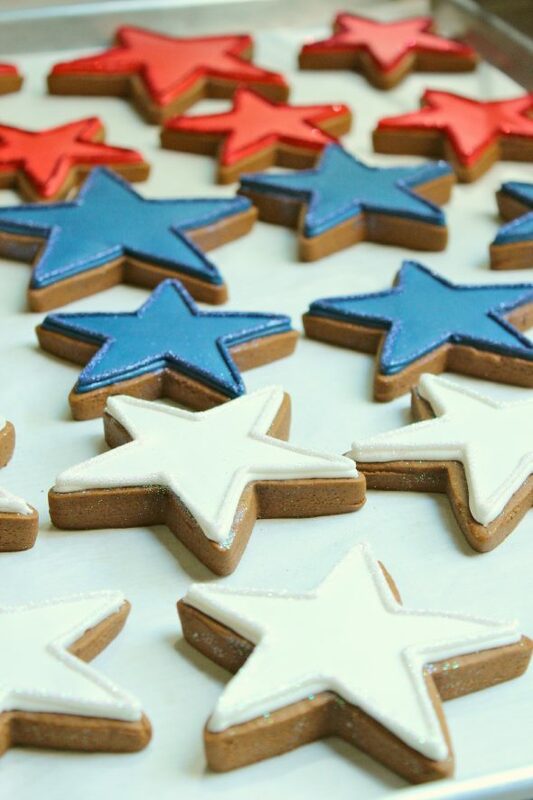 I’ve tried an edible food spray shellac, but it spotted easily on the cookie surface and smells horrible, so I avoid them. If I’m storing cookies for a long time, the best thing to do is to store in covered, airtight containers so humidity and light can’t get to them, at room temp in a climate-controlled area. I store very large pieces in heavy-duty corrugated bakery boxes wrapped in 30-gallon garbage bags, smaller pieces in plastic cupcake caddies also cloaked in garbage bags. 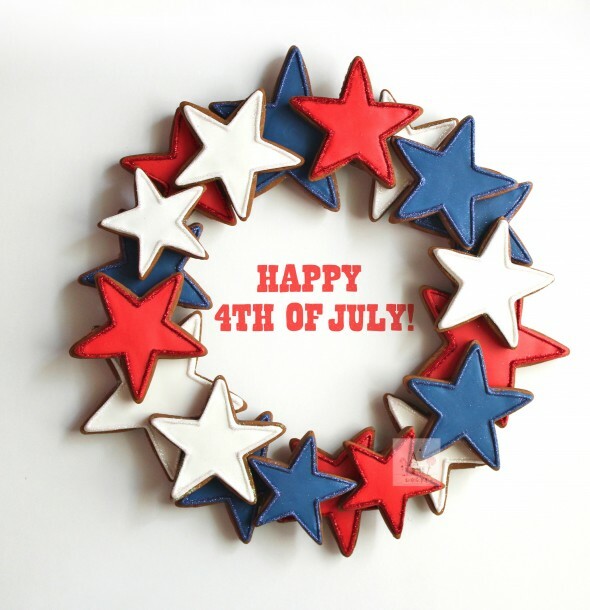 Happy (early) 4th of July to my American friends! Well Marian as usual you’ve inspired me yet again! 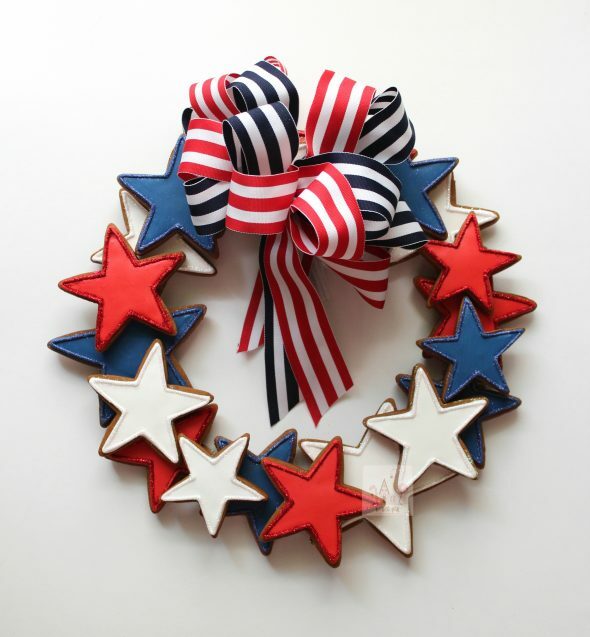 This wreath is so darn pretty and guests would love it. Thinking I could even adapt the idea to any theme as long as there’s contrast in the colours of the shapes. I’m presently experiencing the challenging art of fondant. When I’m done with that I’ll try a cookie wreath.